Although His day was filled from morning to night with many pressures and responsibilities — addressing crowds, healing the sick, granting private interviews, traveling, and training His disciples — He made prayer a top priority. If Jesus was so dependent upon His fellowship in prayer alone with His Father, how much more you and I should spend time alone with God. The lives of the disciples and other Christians who have been mightily used of God through the centuries to reach their world for Christ all testify to the necessity of prayer. They are examples of obedience to our Lord’s command to pray. Someone has wisely said, “Satan laughs at our toiling, mocks our wisdom, but trembles when he sees the weakest saint on his knees.” Prayer is God’s appointed way of doing God’s work. According to 2 Corinthians 3:5, what is the source of the Christian’s sufficiency? How do you tap into that source? Read Psalm 63. 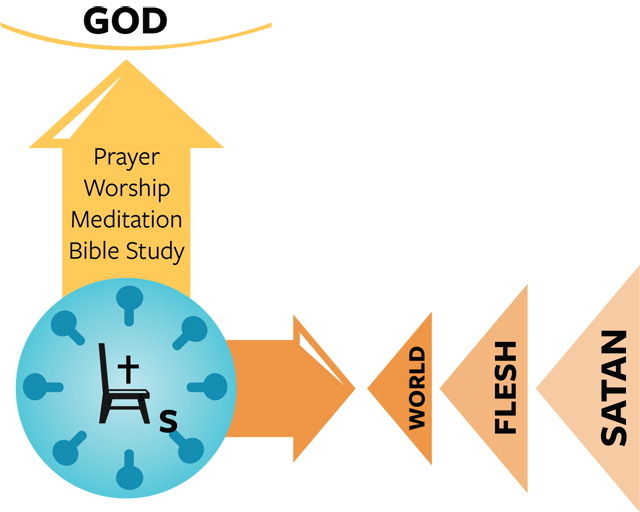 Note the elements of worship and write below the word or phrase that describes how we should worship God; include references (for example, “My soul thirsts for you – Psalm 63:1”). But some will say, “Is not all prayer unto God?” No. Very much so-called prayer, both public and private, is not unto God. In order that a prayer should be really unto God, there must be a definite and conscious approach to God when we pray; we must have a definite and vivid realization that God is bending over us and listening as we pray. In much of our prayer there is little thought of God. Our mind is not taken up with the thought of the mighty and loving Father. We are occupied neither with the need nor with the one to whom we are praying , but our mind is wandering here and there throughout the world. When we really come into God’s presence, really meet Him face to face in the place of prayer, really seek the things that we desire from Him, then there is power. Think about a time when you particularly sensed God’s presence when you prayed. What made this time of prayer different than others? Why? God’s Word promises in I John 1:9 that if we confess our sins He will forgive us. The word “confess” means to “agree with.” This involves naming our sins to God, acknowledging that He has already forgiven us through Christ’s death on the cross, and repenting of our sins (turning away from or changing our attitude toward them). God honors those who truly pray in His Son’s name. What is the promise recorded in John 15:16 and 16:23. What did Jesus promise in John 14:12-14. God’s Word does, however, give us certain basic elements that, when included in our communiction with God, will enable us to receive His answers to our prayers. Intercession. An example of intercession is provided in Colossians 1:3. What was Paul’s prayer for the Christians of Colosse? Many times our efforts in leading people to Christ are fruitless because we forget the necessary preparation for witnessing. 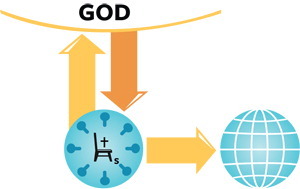 The divine order is to first talk to God about men, and then talk to men about God. If we follow this order, we will see results. Prayer really is the place where people are won to Christ; witnessing is just gathering in the results of prayer. As you meditate on the above, list the requests you can make to God for Christians and non-Christians. Jonathon Goforth was a man of powerful prayer. It is said of him that once he felt assured of God’s will in prayer, he would continue in the power of prayer until the thing was accomplished. Pray for God’s Spirit to enlighten your eyes. Believe in the divine power working within you. Pray that the Holy Spirit may reveal it to you, and appropriate the promise that God will manifest His power in your heart, supplying all your needs. Do you not begin to realize that time is needed — much time in fellowship with the Father and Son, if you would experience the power of God within you? During his lifetime, George Mueller recorded more than 50,000 answers to prayer. He prayed for two men daily for more than 60 years. One of these men was converted shortly before Mueller’s death and the other about a year later. As in Mueller’s experience, we do not always see the answer to our prayers. We must leave the results to God. Faith is a word signifying action. For example, bags of cement sitting in a warehouse will never become concrete until they are mixed with sand, gravel, and water. Likewise, God’s promises will never become concrete unless they are mixed with faith and action. You must make them yours by believing them and putting your faith to work. This lesson will show you some of God’s conditions and promises concerning prayer and His provision for your needs. These promises are real — believe them, claim them, live by them. Down through the years, godly men who have done great things for God have testified to the necessity of having a devotional time. John Wesley, who shook the world for God and founded the Methodist Church, is representative of such great spiritual leaders. He thought prayer, more than anything else, to be his business. The study of the Word of God and the practice of prayer are vitally important for spiritual growth. We may miss a day without feeding on the Word of God or praying and not feel any apparent ill effects in our lives, but if we continue this practice, we will lose the power to live the victorious Christian life. The Christian life might be compared to a soldier in battle. He is out on the front lines but is connected with his commanding officer by radio. He calls and tells of the conditions and problems he is facing. Then his commanding officer, who from his vantage point can see the entire battle area, relays instructions. Similarly, the Christian shares his joys and sorrows, his victories and defeats, and his needs as God instructs and guides him through His word. It is our Heavenly Father who directs us in the adventure of life. He knows the steps we should take. We must take time to seek Him for guidance. Name 2 characteristics of the devotional life of Jesus. (Mark 1:35)When is your best devotional time? None of us can say that we do not have time for prayer and Bible study. We all can make time for things that we really want to do. Whether the period is long or short, set aside some time. Name 3 other places you might find appropriate for your private prayer and Bible study. We should have a reason for everything we do. “Aim at nothing and you will surely hit it.” Our purpose for prayer should be to establish personal fellowship with God and to fulfill our own spiritual needs. 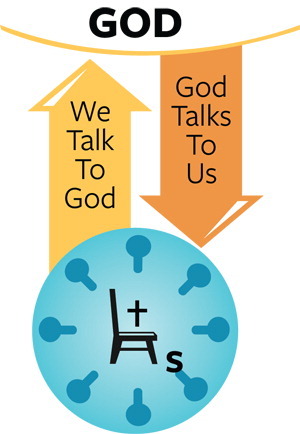 A brief time of meeting with God in the early morning and walking in vital union with Him throughout the day, “practicing the presence of God” is more meaningful than spending an hour or more in legalistic ways and forgetting about Him for the rest of the day. During our devotional time, we should be concerned with learning where we have failed and with rededicating ourselves to the task before us. We should use the time to regroup our forces after the battles of the previous day and plan for the next day’s attack. What particular spiritual need do you feel today? What battles did you have yesterday? The devotional time should include Bible study, prayer, personal worship, and quiet meditation. These aspects of the devotional time are so closely related that you can actually engage in all at the same time. For example, begin by reading a Psalm of thanksgiving or praise. As you read, your heart will respond and you will continue to praise and worship God from a grateful heart. Turn now to another portion of scripture, such as Romans 8. Interrupt your reading to thank God for each truth that applies to you as a Christian. You will be amazed at how much you have to praise and thank God for, once you get started. After you have read and prayed for a while, remain in an attitude of quiet, listening for instructions from God. Write down any thoughts that come to mind and pray about these. Additional activities may include memorizing scripture or reading from a devotional book or hymnal. Study Matthew 6:9-13. Paraphrase this prayer in your own words, using expression meaningful to you. The following questions will help you review this Step. If necessary, reread the appropriate lessons (s). To be more effective in prayer, what conditions mentioned in Lesson 4 and 5 are you now meeting that you were not meeting before? Are you presently following the ACTS guide? (Remember, the guide is not mandatory, it is just helpful.) If you use another system, what is it? How has your understanding of power and promises in prayer been broadened? What specific time and place have you set aside for daily prayer and devotions? What adjustments do you need to make for it to be more effective? Memorize and remember: Effective praying is simply asking God to work according to His will and leaving the results to Him.